A steel plant in the Netherlands has ordered another conveyor for transporting of hot sinter from AUMUND Fördertechnik, Germany. The metallic plate conveyor, type KZB-S 1500/250, is conveying up to 140tph (tonnes per hour) of hot sinter material from the sintering furnace to the circularly arranged coolers. 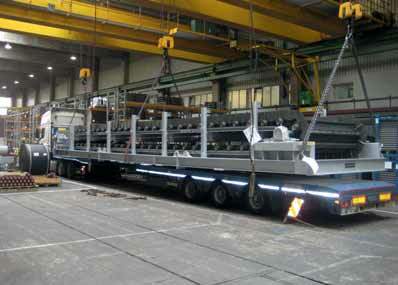 Consequently, already the second line of the steel plant will be equipped with an AUMUND pan conveyor. AUMUND is a worldwide famous supplier of hot material conveyors suitable for hot sinter. The experience with the AUMUND conveyor operative since November 2012 gave the plant managers the reliability to convert the next line. As with the first line, the existing vibrating feeders will be replaced by metallic plate conveyors. The advantages are compelling: wear on the metallic plate conveyor is significantly lower than on vibrating feeders. Also maintenance efforts could be reduced. Thus, the operator is faced with less operating expenses and less downtime. The new transport mode effects on the quality of the sinter as well. Since there is no more vibration as caused by the old vibrating feeder, the new conveyor creates less fines and cracks with the sinter material. Thus, the material has better cooling properties and is more suitable for the subsequent cooler. Finally the improved air flow in the burden guarantees a better usability of this sinter within the blast furnace. In this specific case, the space available for installation of the new AUMUND conveyor was a challenge. Only a very small opening of the platform was available. Through this small out cut, the pre-assembled conveyor could be time savingly mounted on site. The AUMUND engineers fitted the entire conveyor into a torsion-resistant frame. This frame can be divided into five sections. As a result, each of these individual sections can be threaded through the opening provided. This approach had already proven itself during installation of the first AUMUND conveyor in the steel plant. Delivery is scheduled for December 2014. Start of operation is expected for first quarter of 2015 after completion of the entire conversion.